 Age will not be a bar for internal candidates. STIPEND / SCALE OF PAY: 1. The Journeymen in the aforesaid trades will be on 02 years training on fixed stipendiary basis as mentioned above and will be placed in Semi-skilled grade `9460-3%-37840 (pre-revised) or as revised and as applicable at the time of absorption on completion of training subject to satisfactory performance. i) The method of selection will be based on the Written Test of 80 marks followed by Practical Test/ Trade Test of 20 marks. ii) Based on the performance in the written Test and merit, the candidates will provisionally be shortlisted for Practical Test/ Trade Test. Practical Test/ Trade Test The syllabus for Practical Test/Trade Test will be as per NCVT Syllabus of relevant trade. The Trade Test will be of qualifying nature.  Ex-servicemen who have put in not less than 6 months continuous service in Armed Forces of the union will be given relaxation in the age limit to the extent of period of service plus 03 years. i) The method of selection will be based on the Written Test of 100 marks. i) Written Test will tentatively be held at Kolkata on 06 April 2019 and date of Practical/Trade Test (as applicable) will be announced later to be held at Kolkata. ii) Please note that candidature of the candidate is liable to be cancelled if he/she submits more than one application for same post. iii) Persons with Disability category are required to produce Medical Certificate in prescribed format issued by the Competent Authority as stipulated in Rights of Persons with Disabilities Act, 2016 having minimum 40% or more disabilities in the category of HH/VH as the case may be. iv) SC, ST & OBC (NCL) candidates are required to produce a caste certificate only in the prescribed format issued by Competent Authority. v) Candidates serving in Government/Quasi Government offices, Public Sector Undertakings are instructed to submit their application through proper channel. In case, he sends an advance copy of the application, he will have to submit a “No Objection Certificate” from his/her employer at the time of document verification/ Trade Test, failing which the candidature will not be considered. vi) While applying for the post, the applicants must ensure that the particulars furnished by him/her are correct in all respect. In case it is detected at any stage of recruitment or even after appointment that he or she has furnished incorrect / false information or has suppressed any material fact, his / her candidature will stand cancelled and appointment liable to be terminated forthwith. vii) GRSE reserves the right to fill up all the posts or alter the no. of posts to be filled up or cancel any post or even to cancel the whole process of recruitment at any stage without assigning any reason. viii) Candidates are advised to possess a valid e-mail ID which is to be entered in the on-line application form. They are also advised to retain this e-mail ID active at least for one year as any important information to them may be provided by GRSE through e-mail and also published in the web site. x) Any corrigendum/changes/updates shall be available only in the website and no other intimation shall be given in any newspaper/any other media. xi) Candidates short listed for Practical /Trade test are required to produce all original certificates pertaining to date of birth, Caste/Category, PWD category, Essential Educational Qualification & Experience ( if any) in support of eligibility along with one set of self-attested photo copies of the same for verification. In the absence of original certificate/testimonials, the candidate will not be allowed in Practical/ Trade Test and Claim for T.A will not be entertained. xiii) The date of declaration of result / issuance of mark sheet shall be deemed to be the date of acquiring the qualification and there shall be no relaxation on this account. xiv) OBC candidates at the time of document verification, if shortlisted, have to submit declaration to the effect that the incumbent does not fall in Creamy Layer section and also to produce noncreamy layer certificate in the prescribed format as applicable for appointment for the posts under Govt. of India and Central Govt. Public Sector Undertaking. OBC (non-creamy layer) certificate by the Competent Authority should be issued in the current year. xv) Incomplete application is liable to be rejected. xvi) Outstation candidates who will be called for Practical/Trade Test will be reimbursed both ways Sleeper Class Railway fare at actual (by shortest route from place of residence / place of work to Kolkata) whichever is less on production of tickets / receipts for incoming journey. The reimbursement will be made through NEFT mode. Accordingly, candidates are advised to bring their bank details i.e. cancelled cheque leaf & copy of front page of pass book issued by the bank at the time of Practical/Trade Test. ii) All candidates are required to apply ONLINE, take print out of auto generated filled in Application Format, put their signature at designated places and send it along with self-attested copies of testimonials / certificates in support of Date of Birth, PWD Category, Educational qualification, Experience (if any), Ex-Servicemen through ORDINARY POST only to Post Box No. 3076, Lodhi Road, New Delhi – 110003, so as to reach within the due date of 07 March 2019. 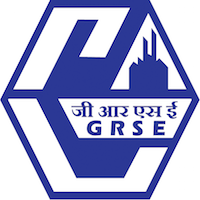 GRSE Ltd. will not be responsible for non-receipt of the hard copy applications within due date due to any postal delay or for any other reason. The envelope containing the application should be superscribed with "GRSE Employment Notification No. HR/OPR&SUP:01/2019(SRD-PWD)" and "Post applied for Journeyman() or Design Assistant". Note: Application without self-attested copies of documents/ certificates in support of date of birth, Caste/Category, Physically Handicapped and Essential qualification will not be entertained.